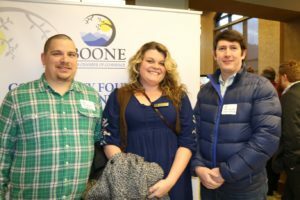 Boone Area Chamber’s Business After Hours ! 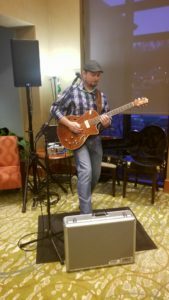 The Boone Area Chamber of Commerce held a Business After Hours (BAH) event on March 8th at the Holiday Inn Express in Boone and was sponsored by Carolina West Wireless. The BAH events are a wonderful monthly networking event arranged by the Chamber to encourage local businesses to become connected and stay informed about local business developments in the Boone Area. 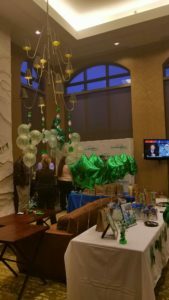 This BAH event, in the spirit of March, was decorated for St Patty’s Day! Not to mention- good fun! Our agent Lee Gillette even made a special appearance since him and his wife have welcomed their son, Ben, into the world. Lee joked that “it was past his bed time” but enjoyed catching up with past clients and Rosa Ivey! Wysteria White, the Director of Public Relations for the Boone Area Chamber of Commerce, does an exceptional job of collaborating the hosts and sponsors to create a warm and welcoming event. Adding to the great atmosphere, and one of the reasons Vincent Properties loves to attend is the great food and beverages from local vendors. This event boasted great samplings of an Irish persuasion from Pepper Moon Catering Co. and tasty brews from Lost Province Brewing! Margaret Roy from the Holiday Inn showcased all the great features the Hotel offers. As Chamber President David Jackson said in praise: “Margaret and her staff do a tremendous job!… Not only for the hosting of people that may come up to do business with you, but also the hosting of events, as well”. Todd Owens, the Director of Marketing for Carolina West Wireless was also very welcoming, making sure everyone went home with a bag of CWW goodies and treats from Appalachian Cookie Co. Owens went on to speak about how great it was to see so many business representatives gathering together in the sense of community. Jackson also noted that this was by far, the largest attended event in the history of BAH. It wouldn’t be a good event without some prizes! Donated by the hosts and sponsors, the prizes included great things such as a blue tooth speaker, yeti cooler and 2-night stay at Wrightsville beach; along with hats from Lost Province. 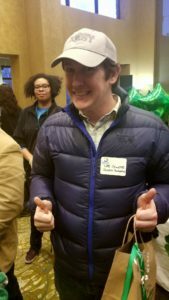 Lucky winners include Ray Russel from Ray’s Weather (and NC House of Representative hopeful), Megan Kieth from the Pet Place, and our very own Lee Gillette won a Lost Province Hat! After the prizes were given away, David Jackson spoke of upcoming events, one of which was the second annual 4 Under 40. This event allows anyone to nominate certain individuals that have done outstanding work for our community that are under the age of 40. At last years inaugural event, Matt Vincent of VPC ( Jay’s youngest son) had the honor of being nominated. You can nominate and vote for 4 Under 40 by clicking here. The winners will be announced at a luncheon on April 18th! Overall the BAH events embody a sense camaraderie and are great way to know what is going on with our local business. If you are ever attending a Business After Hours event, please introduce yourself to someone from Vincent Properties. We love growing our network, but more importantly, making new friends!